Red - a list of the sorts of exercises I SHOULD be doing (slaps own wrist). Glad to hear Mary Massage Lady was able to work her magic. HS - as I may have mentioned before, there's a website called www.kissthisguy.com which lists various misheard lyrics. After my last sprained ankle my physio gave me various exercises to strengthen my ankles - needless to say I don't do them regularly enough. The new clubs are definitely helping .. I can hit the ball further now and am able to hit a similar distance to my mate .. just need to work on not 'topping' the ball quite as much. I ran 5mls late yesterday afternoon after I got back from bowls. It was getting dark by the time I'd finished. I'll do 5mls with the club tomorrow and then on Sunday it's the 'Linda Franks 5' race (the first of our club competition races). Been to town .. ears tested (no change), cheque banked (was going to use a 'human' .. but a 'human' steered me towards the machine which read in the paying-in slip and cheque). Also, two new pairs of shoes purchased (cheaper than expected so bought a brown pair as well as the black pair I wanted). Made a change to be buying non-running shoes btw ..
.. and reporting back that some x-training has also been done The stuff from the loft that was needed over the xmas/new year period has (mostly) been moved from the spare room back into the loft. The items left to move back are the 'extra' dining room chairs and some fold-up trestle tables that are a tad heavy - Margaret's son is over here on Fri so I'll enlist his help with those. HS: I still sing "Scuse me, while I kiss this guy." I think it sounds better. No running since Sunday as I've had a head cold and sore throat (present from London). My lovely little baby grandson was admitted to hospital today with bronchiolitis. He hasn't kept food down for days and has lost all the weight that he'd only just recently put on. He has a streaming nose and is having trouble breathing. Fingers crossed for him. Well done on the 5 miles WtnMel. What would we do without lofts? Having read your exercise routine, Red, I felt quite faint. Thank you Aquarius. He was discharged on the proviso that if he couldn't keep down 400ml of liquid in the next 24 hours he would have to be readmitted. So far, according to his Mum, he's managed that, so they're hopeful that he won't have to go back in. Apparently, this virus is really commonplace in babies under 2. As we walk round in cities with everyone coughing and sneezing, I don't know how we avoid it. I made an interesting discovery yesterday in that, my 10 mile run that I've done for years is, in fact, 11 miles. I traced it yesterday on one of these on-line mappers. I'll be Mrs Sensible and just go for a long walk, today. 'Hope all the running you've all got planned goes well this week, and all the recovery from injury strategies. WtnMel, steady on now - running and xtraining? Excellent! TE, nice running and spinning. Back from my little trip to West Wales. How come sitting stock still on a train for 7 hours for 2 successive days can make you feel as tired as running a half marathon? Have not run since last Saturday apart from a few shuttles up and down the garden. Wil test Achilles this evening in my new trainers. Thanks for the interest in the trainers: I confess I don't know which model of Asics they are but are almost certainly the cheapest in the range (£60ish). There's something of the Alf Tupper in the way I approach my running! Red -glad to hear the treatment is working (John Major as Chancellor: "if it isn't hurting it isn't working"). After that workout a halo is the least you deserve. HS - the metrics look very encouraging. Will you start to target an event later in the year?? Exhausted - so sorry to hear about your little one's illness. Mel - good luck with the 5 miler. Hoping to test the body this evening with a short run - and then make a decision about a parkrun on Saturday. 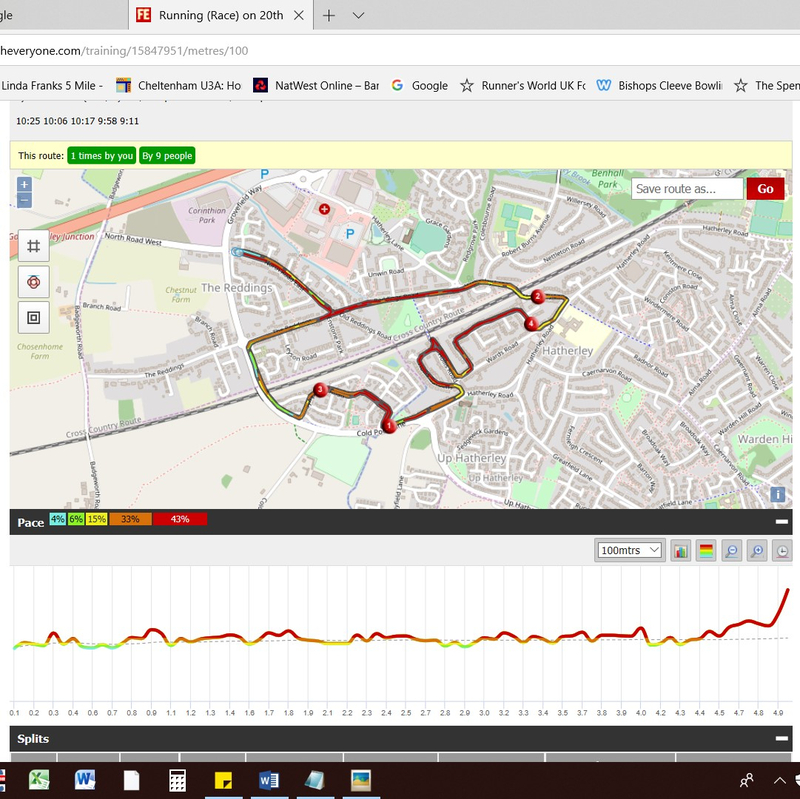 Last minute decision to go training with the club on Tuesday (5k pace around a 500m loop x 4), quite a short session so a little disappointing in that respect, but a fairly speedy one. Rest day yesterday (well, apart from grandchild duties) and in the morning I finally got my pneumococcal jab. This was a case of third time lucky, because at the previous two appointments I was told by the nurse they had none left. They now have plenty of supplies, in fact after waiting weeks they received four times the quantity they were expecting, no wonder the NHS is in a mess. Today I persuaded myself to ignore the cold and snow and have a trot out, only 6 miles but it felt a bit easier than recent runs so I’m hoping my fitness levels are improving. I might have a go at parkrun on Saturday. Our club has set a parkrun challenge for members who wish to participate (parkrun is loved by some members and hated by others, I think it’s a sort of a Marmite thing) the idea is you have to do 13 of the closest parkruns at some point over the next 12 months and it’s your age grading score that is taken into consideration rather than your time. At the end of the year the person running the challenge will announce the winner (being the person with the best cumulative age grading) but you also have to have volunteered at least 3 times at parkrun that year. 13 parkruns in a year doesn't sound like a lot, but it’s about one a month, then there’s the volunteering to fit in and all the travelling to take into account, so I don’t know how many will manage to do them all, but at the moment there’s a lot of interest for it amongst the members. I think I’ll give it a go, whether or not I manage all 13 remains to be seen. Red you put us all to shame, well done for keeping up such a positive attitude while you are injured. JB I fully sympathise about long train journeys, I think it’s being cooped up in one position for hours on end that does it. Get your ASICS on and get a parkrun PB! Very cold again, and glad today is a rest day. WtnMel, Good to hear that your new clubs are helping with your game. Good luck with Sunday's race. Exhausted, agreed "kiss this guy" sounds better. Hope your Grandson soon recovers, and that your cold soon gets better. Interesting that your 10 mile run turns out to be 11. Presume that you don't run with a Garmin? I remember measuring routes on maps with a bit of string, although I once had a map measurer which had a wheel which I moved along the route on the maps. Red, I like your interpretation on the lyrics. Another lyric comes to mind, "nothing but a heartache" nothing but a hard egg" Bonnie Tyler I believe. JB, Did you not doze off during that really long train journey? I've entered the Oakhaven Forest Half Marathon which is on March 3rd, and intend entering the New Forest 10 mile which is in July. I hope to enter more races, but not sure which yet. Aquarius, I had that jab about 3 years ago, and told that it would last for life. Good luck with the parkrun challenge! I ran 8.1 miles in the forest yesterday morning and it was hard going. It was very cold, and the first few miles were into a very strong, icy cold wind. I've run 66 miles so far this year, so all being well, am well on target for the 1000 miles challenge. Exhausted - hope that cold/sore throat clear up soon. Sorry to hear about your grandson but pleased to hear he has been discharged. Re the loft - one problem is Margaret has lost track of what's up there and isn't confident enough to get into it herself to sort through it. I have suggested I'll bring stuff down in batches to the spare room so she can see what's what and sort it out there. Interesting to hear your 10ml run has been an 11ml one .. if that was me I'd be amending my running stats! Red - well done re yet more exercising (putting the rest of us to shame!). JB6 - don't do it that often but long journeys (train and especially car) always wear me out. I tend to buy the last year's model where shoes are concerned which keeps the cost down. Hope your Achilles behaves itself. Aquarius - just 4x 500m loops does sound a short session but well done for going. Glad to hear you finally got your jab after a few attempts. I've only done parkrun twice - tend to find I have other stuff I'd rather do on a Sat morning so that challenge wouldn't appeal to me. Had a nice 5ml run with the club yesterday. Claire's 'word' with the faster runners appears to have worked as more of them were doubling back to find us slower runners. Taking a couple of days rest now until Sunday's "Linda Franks 5" (ahem) race. I think I heard there were around 100 club members taking part. It's organised by my club in memory of an ex-member and the number would be even higher if there weren't so many people needed for volunteer/marshalling duties. On my journey the ticket collector duly asked for my ticket and then required that I produced my 'old git railcard' which of course is fair enough though most just take one look and me and assume that I'm going to have one. Mine is only about 3 days from expiry and as he handed it back he said "that's a bit of out date". I immediately thought I was indeed possessor of a card that was beyond its sell-by (I know the feeling) and prepared an instant defence along the lines of insanity. As I launched into this he corrected me: it wasn't my card that he thought was out of date but the huge tome I was balancing on my lap - Max Hastings' book on the Vietnam war. I then pointed out that it was only published last year and we parted best of friends. Max kept me company for several hours. JB, ticket collectors still on trains, but not guards? I know you are a keen parkrunner and thought you might like a couple of facts and figures. There were 1126 runners at todays Southampton parkrun and 1295 last week. Last week at the Brockenhurst parkrun which is held at Wilverley Inclusure during the winter, a lady runner who was running with her dog on a lead, was tripped by a loose dog that had run off from its owner who was not running. She suffered multiple facial lacerations, a broken nose and swollen knees. I don't know whether the loose dog was attracted by the runner's dog or not, but it does make me wonder whether runners should be allowed to run with their dogs. I haven't run at Waverley since my injury, but on the occasions that I have, dogs have been a bit of a nuisance. One runner had 3 dogs attached to her waist with leads, and the dogs were spread across the trail. On another occasion a dog stopped right in front of me to do its business. No running for me today, but will be running with Alice tomorrow morning. Our parkrun was cancelled today due to icy conditions. It's a very hilly course and there's a downhill section you run down four times that is lethal to even walk on if there's ice or snow on it. JB6 - had a chuckle at your conversation with that railway ticket collector. Mrs Wm bought a Max Hastings book about the 2nd WW (The Secret War) which looks equally massive as the one you mentioned .. every now and then I look at it and wonder when I'll get round to reading it. HS - my local parkrun thinks it's doing well with 600+ .. don't think they've ever attracted four-figure numbers like at Southampton (and not sure Pittville Park would cope with that many either!). I don't like dogs at the best of times - when I read stories like the ones you mentioned about selfish dog-owners at parkruns it does nothing to make me feel more amenable towards them. The weather tomorrow looks like it will be dry although a bit nippy - I think I'll need a couple of layers under my club vest as well as my woolly hat & gloves. I plan to set off at my usual training pace (10:45mm pace) and will see how I am feeling after the 1st lap. Will try and speed up a bit on the 2nd lap if I'm able (and especially if I can see another club member from the Thu group ahead of me!). An earlier than usual Sunday start for me though because the race starts at 9am. I should be leaving home around 7:30am but on the plus side, I ought to be back home for coffee by 11am! One more thing - called BT yesterday to renew my landline/broadband. Got a good deal but no haggling was required. I just pointed out the costs for 'new' customers and was offered the same. So I'll get the same package as I currently have for £12.50/mth less and there is a £50 reward card thrown in too. Happy days ..
Mel - your country needs your deal-making knack for Brexit! Good luck tomorrow - weather looks better than today. Aguarius - what with you, Mel and me perhaps we should start a sub-thread on military history! I've done a couple of guided walk holidays in France (Normandy and The Somme) but Vietnam is a bit beyond my compass. The book makes for grim reading. HS - 1000+ is amazing. I did try to do the Soton parkrun a few years back. This was pre-satnav for us and we got lost but still had time to find the one at nearby Eastleigh. On the dog issue I've never (yet) had a problem but can sympathise with the views of those who have. I've got a bit of an issue with buggies especially on narrow courses. Bognor parkrun for me: 23.08 which is just about right for me given the course and conditions. Got a category 'win' (rare for me these days) and a 6th in overall AG (out of 350+) - Bognor doesn't really attract out and out speed merchants as there's a lot of overtaking required. Overshadowing my effort was my sister's who at 75 made not just her parkrun debut but has never ever run an event of any kind before. She managed 2.5k and then called it a day but that's some achievement especially as she ran and didn't walk. (and I don't think anyone gets embarassed at anything these days. Revolted, perhaps, if there's TMI, but not embarassed). There are quite strict rules about running with dogs at parkruns, aren't there? They have to be kept on short leads, which have to be attached to the owner/runner's waist. I've never had trouble from dogs at parkruns (even from barking before the start) but on the other hand I've only done about 20 parkruns. I can see buggies would be a potential nusiance, but haven't had much problem from them either. Exhausted - that's so worrying, when a really young child is ill; glad your grandson seems to have recovered. With regard to your great-grandma who had 15 children: a friend of mine has 9, and says they brought one another up. I've heard other people with Really Large Families say the same. Red, you are being really conscientious and putting me to shame. The spin bike seems exhausting at the time, and certainly results in the production of a great deal of sweat, and out-of-breath-ness; but doesn't raise the heart rate to anything like the same extent as running. Damien - C25K is wonderful for Getting Back To It. This time last year I was working through a C25K, now I'm aiming for 400 miles in the year. Next week I shall be in London, with grandmothering duties on the side. Shall take running stuff (a stone's throw from Greenwich Park). Corr, HS, you're up and at it with a half marathon booked very soon and other races. You never shirk a run. I've been a real slob all week and just wish I could stop sniffing. Grandson still very ill, being sick and getting stuff down him is a battle. We get daily bulletins and worry. Aquarius. 6 bouts of tonsillitis. Whoo!. I seem to remember when we were children they'd whip our tonsils out willy nilly. Do they not do that now? My antipathy towards dogs is well known, so I won't comment further. It's more deep-seated than my experiences as a runner. We've made a will (at last) and went down and signed it yesterday. Reasons to be cheerful! Our neighbours on both sides have had major garden and building works going on for months. On the right hand side she joked that it would look like the Somme for a while. Well, she wasn't wrong and now we have the rats to prove it. They've done so much digging and drilling that they've obviously disturbed the rat labyrinths. They're enormous devils. I'll leave them alone for a while then take action if it looks like we're the new housing option. On military history, I also do quite a bit of reading on that, although I found Anthony Beevor's book on the Spanish Civil War hard work. There was a Channel 4 series on Vietnam which I started watching, then got behind until it was off-air. I do remember the nightly newsreel footage as a child which always seemed to entail troops jumping off helicopters. I read a book about General De Gaulle called The General and the initial mess he made in the early days of the conflict, which was eye-opening and tragic. I think the worst thing about Vietnam was how it destroyed the lives of young working-class men. If you were well connected or in the higher echelons of education you had better means to dodge the draft, (not that everyone did, of course). Well done on the park run successes John. A run planned for tomorrow, if I feel better. Exhausted: funnily enough I've just read the bit in the Hastings' book about draft dodgers. Apparently, one way of avoiding the draft was to simply get married! Sorry to hear about your grandson. We had a rat inside the house last year. Well not quite - he (or she) managed to get in the cavity wall and from there into the loft. We got a guy in to lay down poison (urgh! and wasn't working) but eventually I worked out that he (the rat not the guy) must be leaving his lair at times in order to get water and food. So I simply blocked his entrance to the house. Of course you have to do this while he's out and not in so I had to establish this first. It was all rather horrible. Exhausted: funnily enough I've just read the bit in the Hastings' book about draft dodgers. Apparently, one way of avoiding the draft was to simply get married! So sorry to hear about your grandson. Columba -I know of no better way to get over-heated (other than watching the House of Commons Brexit debates!) than leaping onto an exercise bike. A spin-bike must be even worse. Good luck with the London parkrun. There are websites which review just about all of them. I recall Ally Pally is one to avoid if you are not too keen on hills. It would be great to do them all (I've managed one in London). A lovely morning here: sunny but no frost. 7k for me but I found it hard. I cut my run dramatically short yesterday as my nose ran so copiously and the cold air rasped my throat. I returned to find Mr E. doing "Confuse-A-Rat" along the back path to our house which is their current highway. Our pest control man is more into rodent psychology than poison and told me on one of his visits that nothing unnerves them more than change. They rehearse a route then get confident with it and if something changes, they do something else. In the past, whenever we've put down poison it seems to kill field mice, rather than rats, which I don't like. So, Mr E was putting down slabs, filling in holes and generally moving things around. John Bateman: We've had similar experiences in our attic to you with all sorts of rodents. We now only put stuff up there which is in rigid plastic containers and we've done our best at blocking up holes. I don't want to kill them, just send them away from the house. A run. I'll try one in a little while (whimper, moan). Hate running! Exhausted - it sounds as though you live in the middle of the countryside? WtnMel, hope your race went well yesterday. I'm also with BT for my landline/broadband, although my mobile is with o2. JB, I've never done the Southampton parkrun, as such large numbers of runners is very off putting for me. Well done for Saturdays parkrun, and even more kudos for your sister doing her first parkrun at the age of 75. To run 2.5k without walking is a real achievement. Well done for the hill reps.
Columba, good luck with Grand Mothering duties. Hope you will be able to run in Greenwich Park. Exhausted, I do try to keep going, and my persistence seems to be paying off. Sorry to hear that you are still suffering with your cold, and hope your Grandson will soon be better. My sister had her tonsils and adenoids removed at the same time when she was small, and was very ill for a while afterwards. Hope you managed a gentle run today without too many problems. Fingers crossed, I don't seem to have any problems with rats, but there are lots of cats in the road, so hopefully they are "taking care of them." Today is a rest day and I got the bus into Southampton, using my OAP Bus Pass, and bought a pair of Asics GT1000v7 road trainers, Salomon Speed Cross 4 trail shoes and 2 pairs of black trainer socks. Yesterday's 10 mile run in the forest with Alice went extremely well, and was probably my best run since my injury way back in 2017. Mile ten was the quickest in 9.15, so I seem to be making good progress. JB6 - if only deal-making was as easy as that conversation with BT. Well done re your category win at parkrun and congrats to your sister re her efforts. Columba - good luck in advance re next week's grand-mothering duties and hope you manage to get out in Greenwich Park as planned. Exhausted - hope you and your grandson both feel better soon. I only got round to making my will 10 years ago - put it off for ages then once it was done, wondered why I'd left it so long. I should explain I'm not into military history in a big way but I do enjoy educating myself about the recent past when I get the chance. My only encounter with rats was a few years back - saw something eating the bird seed beneath the bird table and then it dawned on me what it was. I got a man in to lay poison (he thought they probably had a nest beneath the neighbours shed) and I never saw it again. JB6 (again) - apparently another way to avoid the draft was if you were diagnosed with bone spurs on your heels! HS - see below re yesterday's race. Well done re your 10ml run with Alice and I see you have two new pairs of running shoes to start using. Excellent running WtnMel, your final sprinting pace was amazing. Your Vo2max will have improved now after that race. I agree with you that you should claim victory over Clare by virtue of superior chip time. You may recall a couple of years ago when I was deprived of first MV70 in our clubs Solent Half Marathon, having been 5 seconds quicker on chip time than "the first placer." It was very cold this morning and the roads and pavements were frosty and icy. Consequently I jogged/walked 4.1 miles only, as I was afraid of falling. I was wearing my new Asics GT1000v7, which felt fine. I've just started loading my runs directly to fetch from my garmin, instead of manually adding them. I noticed that they had inserted my mileage against the Asics and the Salomon shoes. I couldn't see how to delete the mileage from the Salomons. I was able, however, to edit so that only the Asics mileage showed on todays training page. I've checked back again using the edit and the mileage against the Salomons has been deleted. I think I will soon get the hang of it. I have "retired" several pairs of trainers that I no longer wore, so there are less to attribute the mileage to. HS - thanks. As they say "I didn't know I had it in me" and I'm happy with my 'moral' victory over LD. I've since found out I was 3rd fastest 'old codger' from my club so I'm currently sitting in 3rd position in the MV65 category of our club's road race championship. I shall enjoy being in 'bronze' position while it lasts! No running for me today as I was visiting my brother in Tring - I'll go bowling tomorrow and will go to the Thu morning club run. Another cold and icy morning, so I will not be running until later this morning. I decided not to attend spin class, as I only "ran" 4 miles yesterday. I will run in the forest in my new Salomon Trail Shoes. WtnMel, you may find that you can't find the table using that web address, so try googling Vo2 max table. I think that you will find 40 "is excellent." Well done, also, HS for your best run since 2017. Thanks Exhausted. I ran 6 miles in the forest this morning, wearing my new Salomon Speedcross 4 trail shoes. This was definitely my best run, with an average pace of 9.47 minute miling.